so, long time no see. I didn’t mean to fall off the face of the earth, but nursing school is intense. we finally got a little breather with the thanksgiving holiday, so I’m popping in to say hi and give a little glimpse in to what life has been like lately. I hope you all are well, and I’m wishing you all a lovely thanksgiving with your families! listening to…what everyone else is listening to. I’m so happy adele is back. since I’m not quite ready to listen to christmas songs quite yet, I’ve been perfectly happy to listen to her album instead. 25 is quite good and quite different from 21. my favorite track is ‘rive lea’. what’s yours? using…this owl pattern blood pressure setup. it makes me smile every time I use it. nurses do serious things, but it’s nice to have a little whimsy to make the hard days a little easier. it does what it’s supposed to, it was reasonably priced, and it’s a hit with my patients. slathering in…new-to-me skincare products. my sister gave me a sephora gift card for my birthday, so I took advantage of that & a discount to re-up on some new beauty & skincare items. I plan on doing a more in-depth feature on these items over winter break, but let me just say that they’re keepers. first aid beauty‘s ultra repair cream is amazing at keeping my eczema patches at bay…I have my eye on the larger size once this travel size runs out. and this cleanser from ole henriksen & this moisturizer from the korean brand belif are all sorts of awesome. my skin has been eating them up. wearing…these adorable & insanely comfortable sperry for j.crew duck boots. my parents were kind enough to give me some funds for my birthday, so these came home with me. I have a slightly higher plaid version of these boots from a previous year that I love, so I bought these as a less heavy-duty slip-on option that could still stand up to snow & the cold. 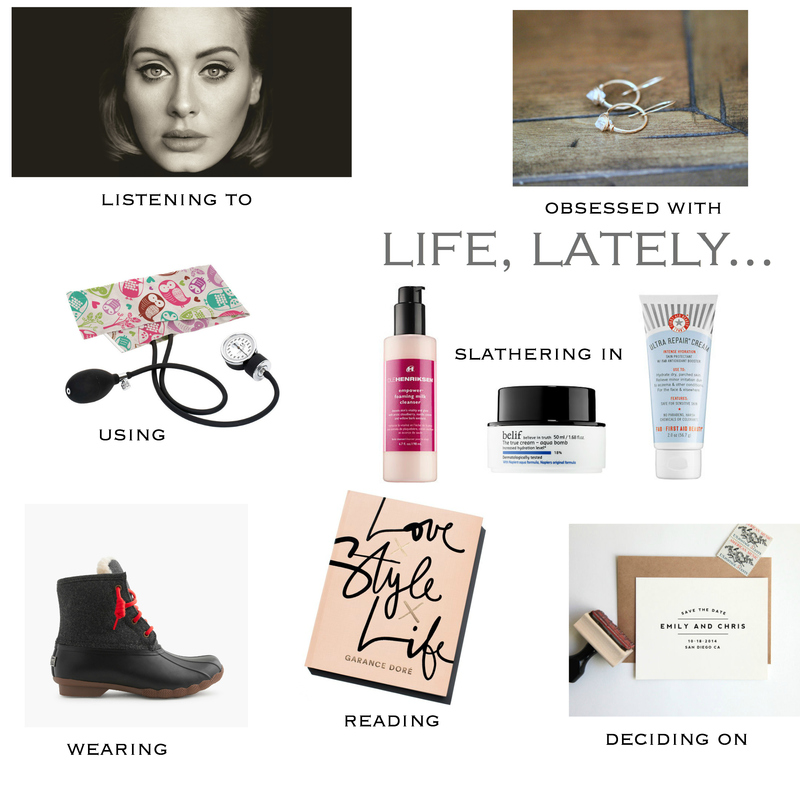 reading…garance dore’s book, love x style x life. this is a beautiful, stylish, honest, & funny book. I’m a fan of hers, so this was a real pleasure for me to read, and I found it to be refreshingly candid & straightforward. it also looks really lovely on a shelf or coffee table and would be totally gift-worthy. deciding on…save the date card designs for our wedding next year (!). I’m leaning towards doing a clean, DIY option. this custom stamp is a strong contender.